STUTTGART -- Robert Bosch GmbH plans to more than double revenue in its automotive technology division to 45 billion euros ($61.7 billion) within 10 years. The supplier sees growth opportunities in Asia's developing economies and in rising sales of electric cars. Bosch expects sales gains in countries such as China, India, Russia and Brazil and in southeast Asia to help it achieve its goal. The shift to a focus on Asian growth offers considerable opportunities, Bernd Bohr, head of Bosch's vehicle technology division, told sales and marketing staff at an internal company event. The same is true for the potential that the growth in electric vehicles represents long-term, he added. Bosch originally wanted its automotive division, which includes after-sales, to hit the 45-billion euro mark by 2015. But the financial crisis and the drastic drop in global car and commercial vehicle sales thwarted its plans. The goal has now been pushed back to 2019, Peter Tyroller, Bosch's sales chief, said at the event. Based on interim figures, the automotive division's revenue fell 18 percent to 21.7 billion euros last year. 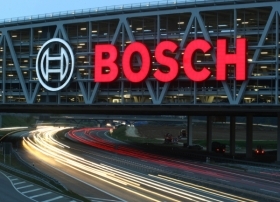 The division delivers 57 percent of Bosch group revenue.